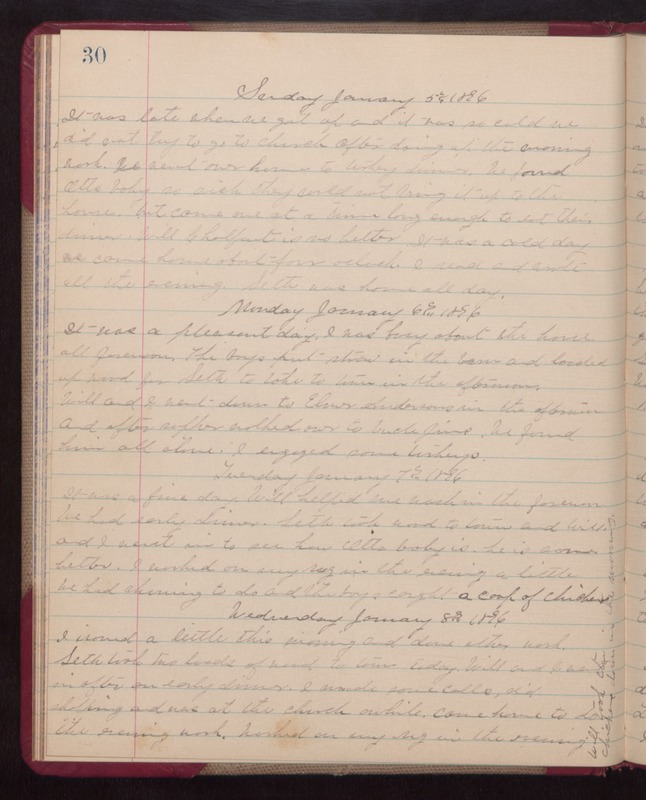 30 Sunday January 5th 1896 It was late when we got up and it was so cold we did not try to go to church after doing up the morning work. We went over home to turkey dinner. We found Otts baby so sick they could not bring it up to the house, but came over at a time long enough to eat their dinner. Will Chalfont is no better. It was a cold day we came home about four oclock. I read and wrote all the evening. Seth was home all day. Monday January 6th 1896 It was a pleasant day. I was busy about the house all forenoon. The boys put straw in the barn and loaded up wood for Seth to take to town in the afternoon. Will and I went down to Elmer Andersons in the afternoon and after supper walked over to Uncle Jims. We found him all alone. I enjoyed some turkeys. Tuesday January 7th 1896 It was a fine day. Will helped me wash in the forenoon. We had early dinner. Seth took wood to town and Will and I went in to see how Otts baby is. He is some better. I worked on my rug in the evening a little We had churning to do and the boys caught a coop of chickens. Wednesday January 8th 1896 I ironed a little this morning and done other work. Seth took two loads of wood to town today. Will and I went in after an early dinner. I made some calls, did shopping and was at the church awhile, came home to do the evening work. Worked on my rug in the evening. Will took the chickens down in the morning.